Immerse yourself in Tuscany’s historical highlights—and enjoy a wine-tasting session, too—on this full-day, small-group tour. Meet your guide in central Florence, and hop aboard your private vehicle. 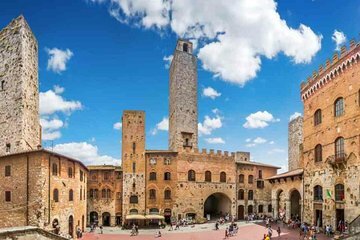 Your first stop is the UNESCO-listed town of San Gimignano, famed for its many towers. Next, explore the highlights of the millennia-old Volterra. In the afternoon, you’ll delve into the heart of the Chianti region, and will embark on a tour and tasting session at one of the area’s esteemed wineries. Finally, return to Florence.